I am new to Ember, sorry if this has an obvious answer but I'm having trouble finding one. Adventure Time - 1x03 - The Enchiridion! 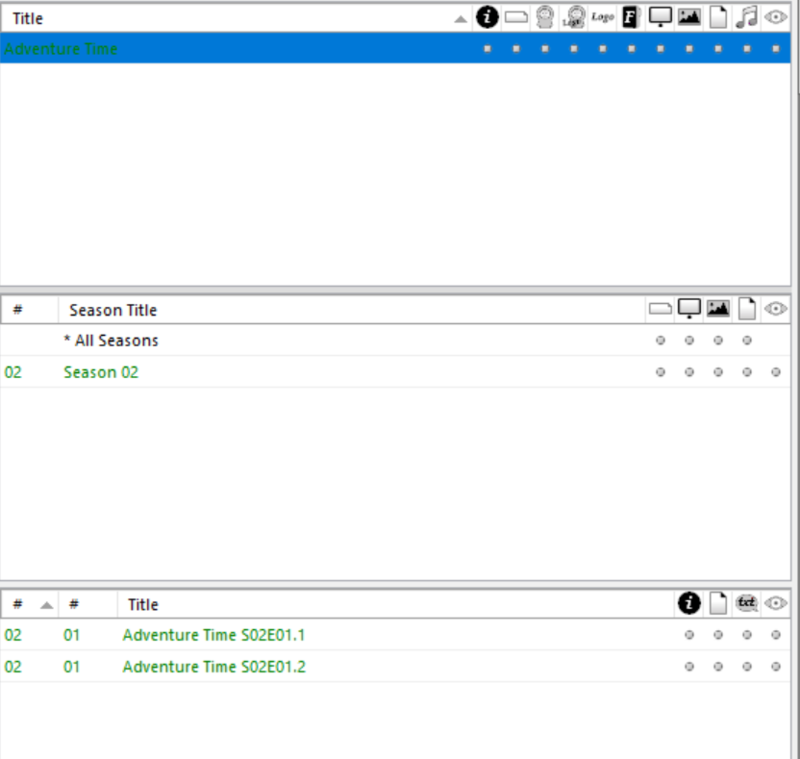 Is there a way to scrape this subepisode data automatically, or is this not supported? Also, is subepisode even the right term? This may be why I'm having trouble finding info. Find your episode and use the corresponding DVD numbering to number your episodes... eg <DVD_episodenumber>1.1</DVD_episodenumber> and <DVD_season>1</DVD_season> for the Slumber Party Panic episode. TVDB is a mess and there seems to be no urgency to fix the problems they created when they updated their site. Does this mean the scraper in Ember should work if the file is labeled s01e1.1 or s01e1.2? This is something I tried before but could not get the scraper to work (both files are matched to episode 1.2). Perhaps the default regex is cutting the decimal? I cannot help you with Ember. There should be no problems using the decimal numbering - S01E1.1. But it only works if TheTVDB has numbered the episode the same way. You can't just randomly place these decimal numberings where you feel like it. The metadata I provided should allow you to see where that numbering is used, and fix your file naming accordingly. The decimal numbering is normally used where an episode was shown on TV as two episodes (normally to fit into the standard 1hr viewing block), but the DVD release shows it as one episode. (2018-08-27, 02:08)Karellen Wrote: I cannot help you with Ember. Could we move this thread back to the Ember forum in case someone there has solved the issue? "Adventure Time - 1x1.1" => "Adventure Time - 1x1"
"Adventure Time - 1x1.2" => "Adventure Time - 1x2"
"Adventure Time - 1x2.1" => "Adventure Time - 1x3"
"Adventure Time - 1x2.2" => "Adventure Time - 1x4"
Please bare in mind I am new to Ember, so I may be skipping something obvious. "The Eyes" is actually Episode 01.2. The title for Episode 01.1, "It Came from the Nightosphere" is not scraped into either file. I believe the nfo data that @Karellen linked to earlier in this thread is pulled from the existing TVDB data for "Adventure Time", so the data is still there. In @Karellen 's data, the two episodes in my example scrape are labelled as S02E01.1 and S02E01.2 as expected. AIRED: s0e1 | DVD: s?e? AIRED: s0e2 | DVD: s?e? AIRED: s0e3 | DVD: s?e? AIRED: s0e4 | DVD: s?e? AIRED: s0e5 | DVD: s?e? AIRED: s0e6 | DVD: s?e? AIRED: s0e7 | DVD: s?e? AIRED: s0e8 | DVD: s?e? AIRED: s0e9 | DVD: s?e? AIRED: s0e10 | DVD: s?e? AIRED: s0e11 | DVD: s?e? AIRED: s0e12 | DVD: s?e? AIRED: s0e13 | DVD: s?e? AIRED: s7e1 | DVD: s?e? AIRED: s7e2 | DVD: s?e? AIRED: s7e3 | DVD: s?e? AIRED: s7e4 | DVD: s?e? AIRED: s7e5 | DVD: s?e? AIRED: s7e6 | DVD: s?e? AIRED: s7e7 | DVD: s?e? AIRED: s7e8 | DVD: s?e? AIRED: s7e9 | DVD: s?e? For me that's the first time that I see a double/subepisode entry for a single (DVD) episode. This information is simply not (yet) considered in Ember. 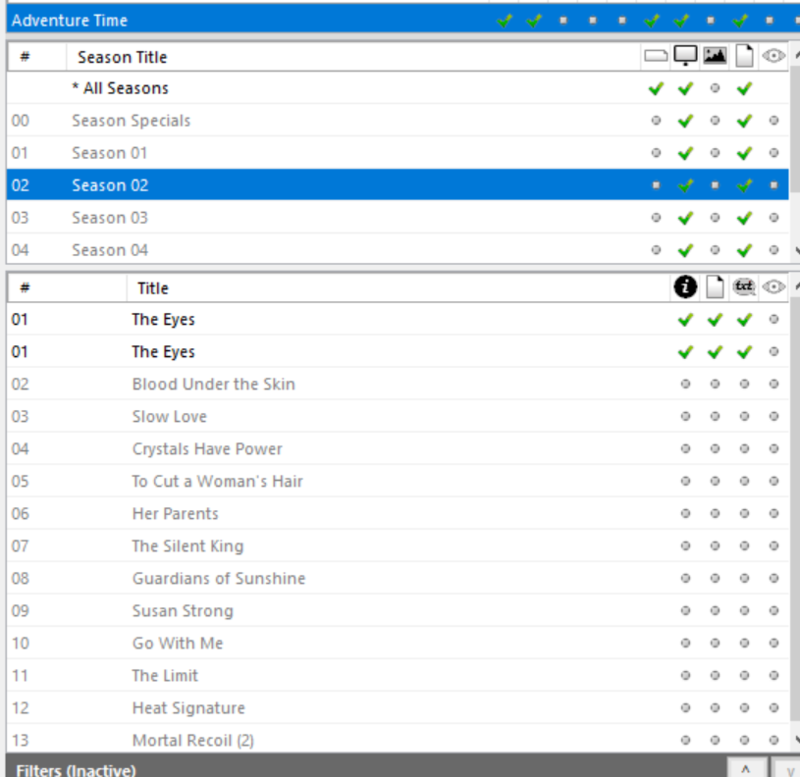 Subepisodes are currently used only for the initially mentioned case. I wrote that on the to-do list.